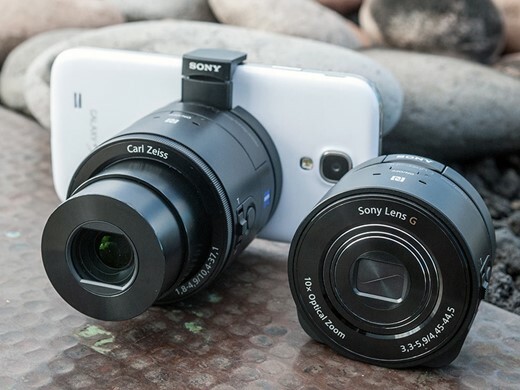 Sony's QX10 and QX100 camera modules attach to and are controlled via Android and iOS smartphones. 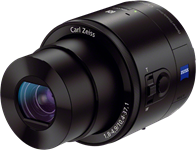 Sony has released a firmware update for its QX10 and QX100 camera modules that bring a couple of improvements. The shutter button can now be used to pre-focus with a half-press which allows you to focus and recompose with the QX modules just like you would do with any digital camera. Sony has also improved the QX models' NFC performance. The modules can now establish a NFC connection to your smartphone quicker, just make sure you've got the latest version of Sony's PlayMemories Mobile app (v4.2 or newer) installed. 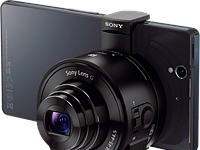 Sony had released an update for the QX modules earlier this year, adding manual control over ISO and real 1080p video recording instead of 1440×1080. This update includes those features, too. So if you haven't installed the previous update yet, you can now kill two birds with one stone. You can find both updates on Sony's support website (QX10 / QX100). I own an A7, but recently bought the QX100 as backup, and so my girlfriend could have some fun. I'm actually really liking it! It pairs really quick via NFC to my Nexus 5 (i really recommend a phone with NFC, doing it through WiFi on an iPhone is a bit more of a hassle, but still OK). It has the same sensor as the RX100II, and a nice Zeiss lens. The pure fact that it can be operated away from the phone enables some fantastic shots! I for example tried mounting it (securely) on a stick and then held it above a crowd at a concert. And my GOD the shots i got! No, i love that Sony makes stuff like the QX100! I really really like it (still prefer my A7 for general photography ofc). Plus, it's really small (and i already ALWAYS have my phone with me so..). It do depend on what phone you have. The newer the better. Edit: And yes, RAW would have been nice! But the ooc jpegs are really nice, and the lack of RAW isn't a dealbreaker for me on this product. It's disappointing that there's no raw. Sony doesn't really understand the market. I think it's a promising idea, particularly the QX100 with the bigger sensor, but as you say it has to have an operating system that works well with the smartphone that's controlling it. I don't own a smart phone, and don't imagine I'd clip such a unit to my smart phone, but mounting somewhere else and then control seems interesting. But as you say things like the NX30 offer such possibilities. Sony is very strange, will go 2/3s of the way but skip the rest. The A7 shutter sound being a current problem, at least that can be fixed with a new model. The new CX900 video camera, which uses the RX100II's sensor, is beautiful, and good in lowlight, but can't equal the color of the Canon G30, which has a much smaller sensor, because Sony insisted on this 20MP sensor. Imaging if Sony had done a 1" 12MP sensor for this video camera? Those 12MPs would allow for the 4K version too, and have better dynamic range. Actually, on the QX10 (which I have) it adds ISO adjustment and a bump in video recording from 1440 x 1080(30p) to 1920 x 1080 (30p). These are things that should have been on the camera from the start but its nice to see them added. I was lucky and picked up the QX10 as ex demo unit for a few pounds over 100 GBP and I like it for its fun factor rather than as a serious camera. I can live without RAW capability but I still think sony should have added some sort of manual control for shutter speed and aperture like its bigger brother - I'm convinced that was solely for product differentiation and could easiliy be added in a firmware upgrade. That's not what your mum said.